VR in Education: Moving the Classroom to Mars (and other field trips)! For years, even decades, people have talked about how virtual and augmented reality and technologies could be used in the classroom, but it is only with the current wave of consumer VR devices that there is in schools on a large scale is becoming practicable. But to be effective we need to understand the pedagogic basis on which such technologies can be used, and provide the tool for teachers to be able to create their own VR experiences tailored to their own students. This presentation will look at the scope for the use of VR technologies in schools, describe some of the pioneering systems, and summarise the pedagogic underpinnings of VR use. It will then describe the Fieldscapes system as one example of a VR authoring system that will allow educators to create and share VR content, and how for the short-medium term a mix of VR and non-VR usage will need to be supported in order to cope with school ICT budgets, issues and concerns and different modes of use in and out of the classroom. 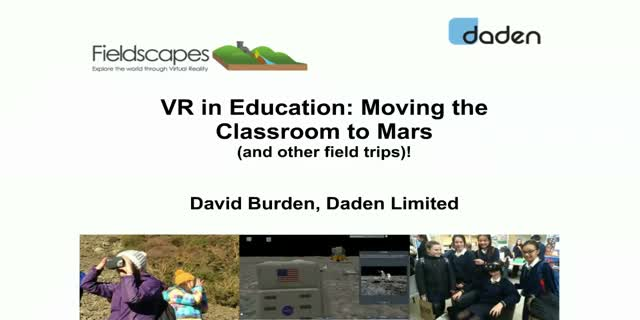 Title: VR in Education: Moving the Classroom to Mars (and other field trips)!